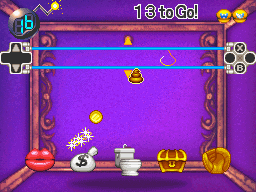 Trash It is a minigame found in Wario: Master of Disguise. The player must use the to guide each object to the place where it belongs. As the difficulty increases, more objects are produced at a faster rate. "Use the stylus to drag falling items to their proper receptacles, raising and lowering the item generator as needed." This page was last edited on March 12, 2018, at 21:13.